Studies show that regular exercise significantly lifts mild to moderate depression and, in some cases, is as effective as anti-depressants. That’s because working out leads to changes in your brain, such as increased bloodflow and the creation of new neural pathways. Hormones such as endorphins (make us feel high, and a natural painkiller), serotonin (regulates mood and helps make us feel calmer), dopamine (keeps you coming back for more) and testosterone (important for muscles and libido) are also released. The health of the bacteria in your gut (microbiome) is crucial to your overall health, including your emotional welfare. Yes, your belly (ie your diet) can determine how happy you feel. Most people’s microbiome has been battered by years of stress, medication (especially antibiotics), a less than saintly diet (particularly processed food) and illness (a bout of flu can be a heavy knock, for instance). Restoring your microbiome to a healthier state – through probiotics and eating better – could make the world of difference to how happy you feel. We’d advise getting professional help from our naturopathic nutritionist Rhi Hepple as it can be an uphill struggle to do that restoration work yourself… because the unhealthy gut bacteria that are making you feel low will also be making you crave junk food and anything sweet! If you reach for a chocolate bar at some point most days, this is a sure sign that your microbiome is out of balance. And that will be making you feel less happy. Read here about giving yourself an emotional and physical boost by resetting your micro biome for spring. Even better, book a consultation with Rhi who will be able to help you not only find out how healthy your gut flora is but also reasons why it may be below par and measures you can take in your daily food to make yourself happier by keeping it healthier. Your use of your phone, the internet and social media could be denting your happiness. Research at the University of Gothenburg found that ‘intensive use of cell phones and computers can be linked to an increase in stress, sleep disorders and depressive symptoms in young adults’. And a study from the University of Illinois confirmed that people who described themselves as having addictive-style behaviour toward the internet and mobile phones scored much higher on depression and anxiety scales. So our advice is: limit your phone use daily, and try having regular digital detoxes – a whole day off is both liberating and surprisingly uplifting! The annual National Diet and Nutrition Survey shows that 90% of people in the UK have lower than recommended levels of Vitamin D. This is a nutrient that comes predominantly not from our diet (you’d have to eat 2-4 servings of wild salmon every day to get enough) – but from the sun (hence its nickname, the ‘sunshine vitamin’). Through winter there just aren’t enough sun hours in the day in this country for most of us to have optimal levels of Vitamin D. So if you feel unhappy, especially through winter, we’d advise taking a Vitamin D supplement. We stock a range of top-quality Vitamin D supplements, some to keep your levels steady, others to boost you if you are seriously depleted. Scientists have found that people who live near green spaces have higher life satisfaction and less mental distress than those who do not, and those who spend more time outside have a more positive body image and higher self-esteem. Research shows that the ability to become aware of and regulate your breath is key to lowering feelings of stress and anchoring yourself in the moment – both crucial to happiness. Just think how agitated you feel when you start shallow-breathing when you’re under pressure! Trouble is that, if you’re not careful, many people never slow down enough or relax so they ‘unlearn’ how to breathe properly. 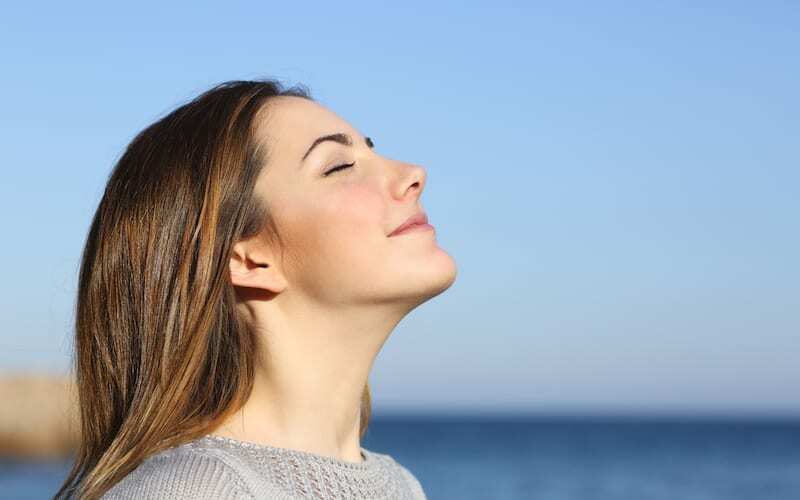 Alternate nostril breathing is a brilliant way to relax and stop negative thoughts playing on your mind. All our yoga classes have an emphasis on breathing as well as the physical work – here, for example, our yoga teacher Shelley explains how to learn to breathe properly though yoga. Hannah offers a monthly yogic relaxation class where you can learn breathing and other relaxation techniques to help boost your feelings of well-being. And Jane’s weekly movement, relaxation and meditation also includes breath work for relaxation. Could your gut be the cause of your low mood and anxiety?